Gunkholing: Cruising in shallow water and spending the nights in coves. It is my hope that this site will grow to become a resource page for recreational sailors and power boaters cruising the waters of Nova Scotia, and the in-land waterways of Canada, and as a travelogue of our family's journey as boaters. September 10th - Finally the Web Master has returned from moving and vacations and getting the kids off to school and he finds nearly a month's worth of logs in his e-mail to post... Find out more about the sudden end to Saga 2006 by continuing your reading at Day 51 - St. Ignace Municipal Marina. More photos have also been received, need another day to post them. July 27th - The day following the last installment of our Traversing journey saw us returning to Brockville to handle some personal matters. We will be returning to Water's Edge in Spanish this weekend and will recommence our tour at that point. 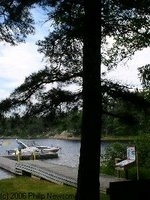 July 14th - New Log Entries from Water's Edge are just in from Little Current. Log Entries start on July 9th. Pictures have also arrived for all previous logs and all log pages are being updated. 'Water's Edge' (29' Bayliner) Cruising the St. Lawrence Seaway, Great Lakes and Inland Waterways of Ontario, Quebec and the mid-west US states. 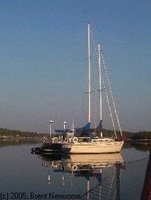 'Te Aroha' (31' Sloop Rigged Folk Boat) that cruises the Eastern and Southern Shore of Nova Scotia. Te Aroha is currently in Dry Dock this summer for a new deck. Pictures will be posted shortly. All Content and images are (c) 2006, Brent, Erica, Phil or Eleanor Newsome. Use or reproduction without permission is prohibited.